Deepen your connection with yourself. Strengthen your connection with others. Author and teacher, scholar and thinker, Dr. Adela Sandness invites you to join our conversation about mindfulness, power, relationships, leadership, gender, the body and how we live in it. She brings ancient wisdom and her depth of mindfulness practice experience - along with stories, humour, compassion, care and a healthy dose of common sense - to help us rediscover ourselves and our relationships and re-think together today’s world. Subscribe now: Just Breathe….You Are Enough™ is a gift you give to yourself. Where do grown-ups come from? Where do the children go? Do we grow old only if we have stopped growing? Today we reflect on self-existing joy. “Now, take this huge tree here, son. If someone were to hack it at the bottom, its living sap would flow. Likewise, if someone were to hack it in the middle, its living sap would flow; and if someone were to hack it at the top, its living sap would flow. Pervaded by the living essence…, this tree stands here ceaselessly drinking water and flourishing….that is how you are." Today, we reflect on how to “breathe through the heals”. The house is freshly cleaned. The fridge, and closets, and cupboards – all the storage spaces – were sorted. What needs to be let go, re-purposed and released? What has a place in my world? Putting things in place, one after the other: it creates structure. Because of this structure, there is space. Thank you for joining us as we reflect on limits, and limitlessness, and the space in-between in which we all live. Do you try to squeeze yourself into a box that someone – or something - else has shaped for you? Does it feel artificial, constrained, contrived, and far too small? Today we reflect, and observe, that their concept of you is a reflection of them. Your concept of you is a reflection of you. You don't need to buy-in to limits set by someone else’s story. We are each the hero of our own story. Have you ever noticed that we both give and receive with an open hand? This is the fifth of "7 Ways to Take a Deep Breath". Engage the body – engage any activity – with the spirit of play: exercise, movement, dance... you know what it is.... Play because it’s fun. It is a way to offer ourselves space to hear the wisdom of the body….left there, perhaps, as a gift from the gods. This is the fourth of "7 Ways to Take a Deep Breath". The body becomes home when the mind, heart and spirit can live there. This is the third of "7 Ways to Take a Deep Breath". Sometimes it is by means of structure that we give ourselves space. A river is life-giving because of the boundaries of the river's bed. It is the limits that create the space in between. This is the second of "7 Ways to Take a Deep Breath". 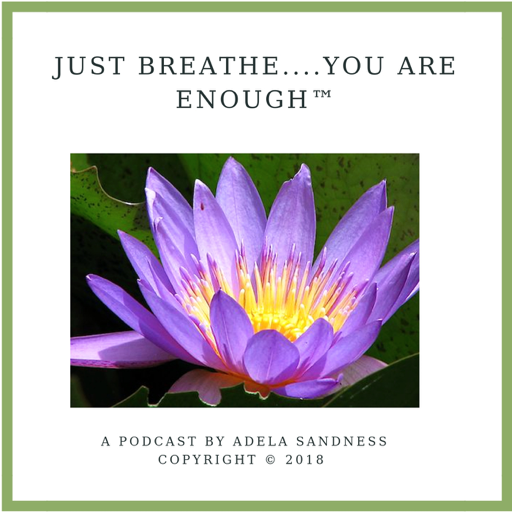 Welcome to Just Breathe....You Are Enough™ - The Podcast!! We begin the journey together. © 2019 OwlTail All rights reserved. OwlTail only owns the podcast episode rankings. Copyright of underlying podcast content is owned by the publisher, not OwlTail. Audio is streamed directly from Dr. Adela Sandness servers. Downloads goes directly to publisher.